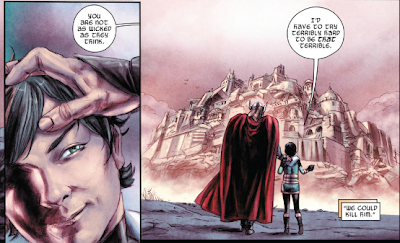 Kieron Gillen's run of Journey Into Mystery (i.e. 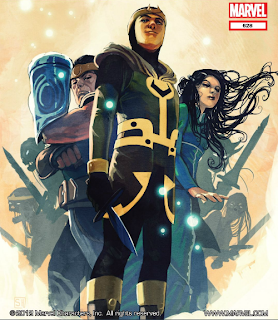 issues #622-645), starring kid Loki, is one of the best things I've ever read. Not "one of the best comic's I've read," but one of the best things I've ever read. Heck, I would even go as far to say it's one of the greatest pieces of fantasy fiction out there in any medium. Sure, I'm biased, since we all know I'm a huge Loki fan. And my love of Tom Hiddleston's Loki is the reason why I picked up Journey Into Mystery (JIM) in the first place. At least, it's the reason I purchased it in the first place. I didn't actually read it until I realized that kid Loki was going to be on the Young Avengers, which you guys know I also love. So yes, I was biased going in with my love of Loki and my desire to know about the kid version of him who would be on the Young Avengers. But it didn't take long for kid Loki to worm his own place in my heart, entirely separate from Tom Hiddleston's Loki. Yes, they are both Loki, but they are not the same Loki. Kid Loki is so adorable, so endearing, so amazingly precious. He's got so much heart. How can you not feel for this kid? He is considered one of the greatest threats of Asgard to ever live. In fact, he betrayed Asgard and then died saving it, for a reason no one knows (and the question of why Loki did it is an important one to JIM). And he doesn't remember any of it. He doesn't remember being a villain. All he knows it that everyone expects him to be a villain, and that the only person in the world who loves him is his big brother Thor. But it's not just Loki as a character that makes JIM so great. It's the entire story-line. The first story is a "Fear Itself" tie-in, meaning that in the Thor comic there is a storyline called "Fear Itself" and JIM gives the entire series of events from Loki's perspective. But you don't need to read "Fear Itself" or any of the other Thor comics that JIM parallels. If you're not huge into comics or the Marvel-verse, I suggest doing what I did: reading the entire Keiron Gillen run of JIM as if it's a novel, a standalone. And when you do that it's perfect. The plot is so fantastical and great in a way that only epic fantasy can be. You know the sort of plot I'm talking about: the one where what everyone says or does is extremely important, even if it doesn't seem so at the time. Something that someone said in the first issue is incredibly important to the last. Something that happens in the fifth issue* and then is forgotten, shouldn't have been forgotten because it comes back. Basically, this entire run of Journey Into Mystery is perfect. I laughed and giggled at Loki's mischievous antics, for he truly is mischievous in this series. I was shocked and surprised by some of the twists and turns. And at several points, I cried** for kid Loki. And in the end, I raged against Kieron Gillen. Because he wrote a perfectly brilliant story, one that will haunt me for a while. *This is not a spoiler. I just picked a number at random. I am in no way saying that something in the fifth issue of JIM is particularly important. Though to be fair, something probably is. Because everything in JIM is important. **I only ever cried on the inside, because I rarely actually cry while reading. But this series got me close, man. It got me close. That being said, there were definitely times I literally laughed out loud. It was funny.